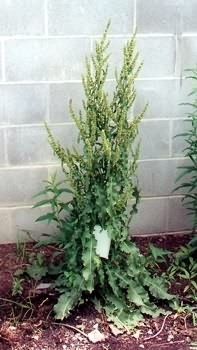 Family Polygonaceae, genus Rumex L.
Root vertical, spindle-shaped, strong. Stem erect, glabrous, largely but shallowly grooved, 40 (60)-150 (190) cm. Leaves lanceolate or oblong-lanceolate, drawn out at apex, narrowly wedge-shaped at base, highly wavy along the edges; blade 15-25 cm in length, 1.5-4 cm in width; petioles slightly shorter than blade; upper leaves smaller, their petioles shorter. Inflorescence narrow-paniculate, up to 60 cm in length, with aggregated branchlets. Inner parts of perianth rounded-ovoid, cordate at base, with acute top, smooth or weakly serrated along edgess; all or only one of them with rounded-oval tubercle, several times shorter than it is long. Nut three-edged, dark brown, shiny, 2-3 mm in length, 1.5-2 mm in width, 1-2 mm thick; weight of 1,000 nuts is about 2 g. Seeds remain viable for 25 years or more. The seeds and tuber buds produce shoots in early spring. Maximum fertility of one plant is 7,000 seeds. The seeds germinate from depths of no more than 5-7 cm. Shoots are sour-salty. Freshly ripe seeds have no period of rest. Occurs throughout the European region of the former USSR (except the Arctic), the Caucasus, western Siberia, as an introduced plant in the Far East, and in Central Asia (except in deserts). Outside the former USSR, species occurs throughtout most of Europe, North Africa, Turkey, northern Iran, and central Asia. It is antropochorus worldwide, but especially in eastern Asia and North America. Inhabits humid meadows, banks of reservoirs, kitchen gardens, borders of fields, dusty places, slopes, and roadsides. It is common among perennial grasses and grain cultures and after stubbing of gardens. Ruderal weed rather than segetal one. Prefers moderately damp, fertile, heavy in mechanical structure, nutrient-rich soils. A weed of perennial grass crops. It is often found along borders of fields. Strong root system; it regenerates easily when cut, which makes it difficult to eradicate. Control measures include deep cutting of root system at the beginning of growth and development, which strongly depresses the weed and causes its death. Artokhin, K.S. 2004. Atlas Weed plants. Rostov-na-Donu. 144 p. (in Russian). Jonsell, B., ed. 2000. Flora Nordica V. 1. Lycopodiaceae-Polygonaceae. Stockholm: BTJ AB. 344 p.
Komarov, V.L., ed. 1936. Flora USSR. V. 5. Moscow; Leningrad: AN SSSR. 762 p. (in Russian). Ulyanova T.N. 1998. Weeds in the flora of Russia and other CIS states. St. Petersburg: VIR. 233 p. (in Russian).